Sidestep in perfect pace with someone who has fewer feet than you. Sit properly in front of a crowd, while your favourite person walks away. Sort through a pile of identical items to find the one that belongs to that person — by smell. Can you do it? Heart can. And she's a 3-year-old Labrador retriever. Heart won the Westminster Kennel Club dog show's first-ever obedience competition Monday with a crowd-pleasing, tail-wagging display of canine deportment that included fetching a few heart-print pillows. "She is just amazing," said owner and handler Linda Brennan, of Columbia, New Jersey. Plus, "we had the cute factor." At this level, it's no simple sit and stay. In fact, it can seem unimaginable to an everyday dog owner. The dogs in the ring had to sniff out and fetch a dumbbell their handlers had touched from a pile of otherwise identical dumbbells, for instance. The crowning challenge: sitting in a group while their handlers circled the ring twice without them. The dogs had to do it all in front of hundreds of people. The handlers couldn't use treats. Points could be deducted for something as subtle as sitting crookedly. And that was just the first round. The 10 finalists did elaborate six-minute routines, sometimes spinning, walking backward and weaving through their handlers' legs. One dog fetched sections of board its handler pieced together to form a heart. Second-place finisher Smartie, a Belgian Tervuren, stacked water bowls with her mouth. "She really loves figuring out the puzzle of obedience," said owner and handler Julie Hill, of Mandeville, Louisiana. 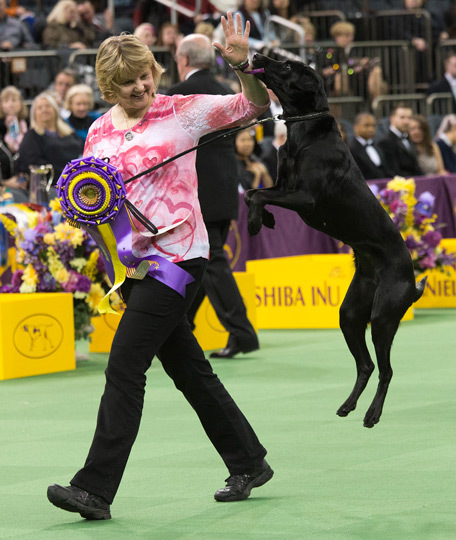 She also handled Smartie to a finalist finish in Westminster's agility competition Saturday. The third-place obedience ribbon went to Chase, a golden retriever owned and handled by Pauline Hosenfeld, of Columbus, Ohio. Obedience exercises are meant to represent good dog manners, safety needs (like stopping on command before running into the road) and certain herding or hunting skills. The sport dates to the 1930s in the US, and the number of obedience contests sanctioned by the prominent American Kennel Club has grown in the last five years, from about 2,500 to 2,650 annually. But some other canine sports, such as agility, are growing faster. "It's maybe not as flashy as agility, but it really cements the relationship between the owner and the dog" as they work out signals and read each other, said Dr. Merry Fitzgerald, a Lake Grove, New York, veterinarian who competed with Margot, a Doberman pinscher. Most competitors train for at least a little bit almost every day. Handlers note that training methods have changed over the decades to emphasize rewards over punishment, and they say they strive to make training fun. And yes, even obedience dogs sometimes can be mischievous. "We often allow our dogs to be a little bit naughty in real life," Brennan said.